Beverley R. Wheeler (DC’76, HNZ’78) credits CMU for its unique combination of innovation, collaboration and cooperation. 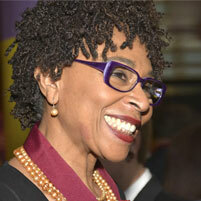 Wheeler is an adjunct faculty member in the Heinz College and a former president of CMU's Alumni Association. She was one of three outstanding Dietrich College alumnae honored at an awards ceremony over Commencement weekend. Siriana Abboud (DC’16) and Minnar Xie (DC’16) also received awards.